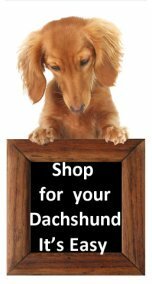 ...depicted in, rock and tomb drawings, some thousands of years old, found in countries such as Egypt, South America and China, but the dachshund we know now, seems to have originated in Germany over 400 years ago. Selective breeding by German foresters developed a breed of hunting dog, mostly used to hunt badgers, as the land owners at this time considered badgers a pest. The dachshund was also used to hunt foxes, rabbits and when working in packs, bigger animals such as deer and boar. The hunters needed a hardy dog that could follow quarry through thick undergrowth and even underground with fearless spirit and a build suitable for fitting into narrow burrows. Even with their short legs they could cover distances at speed, with a loud bark to let the hunters stay on the trail. The name Dachshund is derived from two German words, dachs meaning badger and Hund meaning hound, pronounced dacks-hoont not dash-hound, as often heard. According to Dachshund history these small dogs first appeared in UK in 1840 when Prince Consort received a number of smooth haired dachshunds from Prince Edward of Saxe-Weimar these dogs were kept at Windsor and took part mainly in pheasant shoots. The first Dachshund dog show was in England in 1859, another royal to show interest in the Dachshund breed was Queen Victoria, her interest in dog shows improved the dachshund dogs popularity. During the First World War, because of their German origin they went out of fashion as anything to do with Germany was not popular and it has only been by the efforts of dedicated breeders that they are now one of the most popular small dog breeds. The first Dachshund arrived in United States in 1870 by 1895 the Dachshund Club of America was established. Initially they were used for hunting rabbits and other small game but over some years evolved into a household pet, while still retaining their hunting instincts they really enjoyed being with people, and the fun and interaction they can create. They are now one of the most popular small dog breed in America.